The Cool Colour Paint is a heavy bodied, non-toxic acrylic coating fortified with non slip properties, and high quality pigments which exhibits superior qualities of durability, strength, flexibility, and water and weather resistance and long lasting. Cool Colour paint is ideal for flexible surfaces. In comparison to other surfacing products Cool Colour Paint offers reductions in surface temperatures to the light colour options. Cool Colour Paint is available in a range of fun colour combinations with themes as an option. The Cool Colour Paint Coating has been designed especially for Australian conditions. It is resistant to mould, fungal growth and a wide range of chemicals. It is unaffected by UV infra red radiation and ozone. The product is classified as non-hazardous under work safe guidelines and is manufactured under a quality system, which is certified compliant with ISO 9001 Standards. 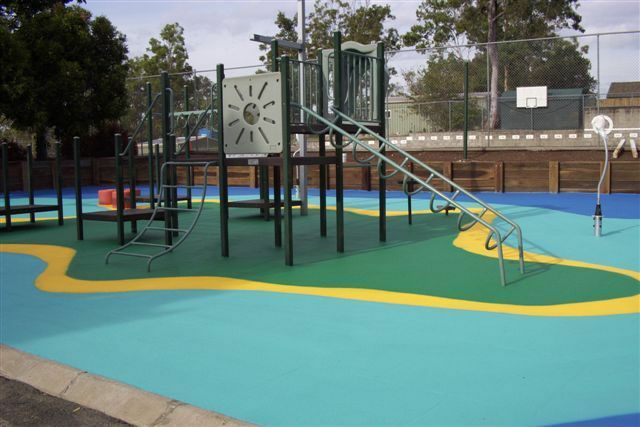 Cool Colour Paint can be used to coat new or old rubber playgrounds. Application is by roller, brush, or texture spray units. The dried coating has a low sheen finish. Cool Colour Paint is supplied in 15 litre pails our standard colours are available in pre-mixed Green, Blue, Yellow, Red or Terracotta. All equipment can be washed up with water. The Standard Black tiles are designed for the Cool Colour paint coating to be applied. The Standard Black tiles are factory fabricated with computer controlled thickness of 15mm or 20mm. The Standard Black tile laid in conjunction with soft fall rebound protection underlay tile is its foundation for impact attenuation; this base system offers consistency in thickness, density, and resiliency. The Standard black tiles are installed in brick pattern and all seams are sealed and bonded with a tough, abrasion resistant polyurethane construction adhesive on site then painted with the cool colour paint coating. Use the Softfall rebound protection underlay in conjunction with the standard black tiles to ensure compliance with Australian Standards. (See Fall Height Graph to determine correct thickness required). The Cool Colour Paint surface system conforms to Australian Draft Standards AS/NZS 4422/96 when site tested. The product comes with independent laboratory test results showing conformance to these requirements at the fall height specified by the purchaser on both the body and seams of the product.